Rifles, Shotguns, and Pistols — oh my! Ramping up for SHOT Show, 2018 another major gun maker announced today that they'll be releasing a brand new to market gun that has us pretty excited. 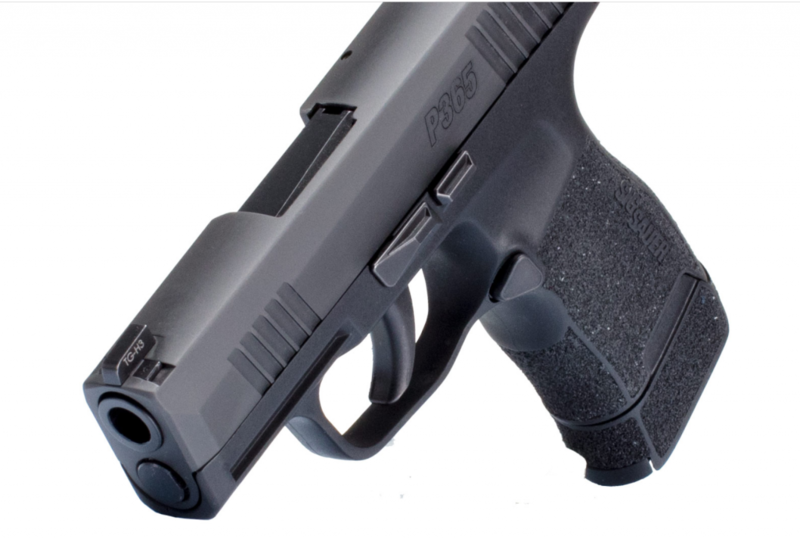 SIG Sauer's P365 (as in it's a gun you can carry 365 days per year) is a polymer-framed, striker-fired micro compact, that may raise the bar a bit higher for concealed carry guns of this stature. Raise the bar how? Well, for starters it is capable of carrying a double stack 12-round magazine in a gun that's only an inch wide. More on this in a minute … Also raising the bar is the accessory rail, night sights, front slide serrations, and the textured grip. Furthermore, I've obviously not had my hands on this little pistol, yet, but the controls look to be a decent size for my massive hands, which is always a benefit for me when it comes to actually operating a firearm. One thing is for certain, we will be visiting SIG Sauer on range day to get our grubby hands on this new gun. The P365 comes with a 3.1 inch barrel, an overall length of 5.8 inches long, with a dry weight of 17.8 ounces. Its capacity is what has me more excited than anything else. It comes with two 10+1 magazines (one flush, one for a pinky) or the available 12+1 capacity magazine if you feel like springing the extra $55 for the bigger mag. When you squeeze that into a gun that is only 1-inch wide, you've got a winner on your hands. Cost? As of right now, the MSRP is set at $599.99, but street prices will likely be a bit lower than that, once they can actually be found on the shelves. If there is something I know of SIG's pistols, its that people make that initial mad-rush to the store to gobble them up like a goat in a grass factory. Our coverage for SHOT Show, 2018 is right around the corner, and we are in pre-game mode. Make sure you stay tuned, as we look forward to covering this little pistol for you to see, at the range and show floor. What do you think about the P365? Something you'll be looking to get? Let us know, below. What Exactly Is ‘Gun Violence’ According to the Gun Grabbers? I think I just found my next gun. Looks close to size of the ruger lc9 but capacity of the p320. I don’t believe I saw a release date on it, but I would suspect that it wouldn’t be any later than a few weeks time. I’m pretty stoked about this too, make sure you follow our SHOT Show coverage to stay up to date on the new guns and gear coming out. Looks like a winner. What will it cost? $599 is the set MSRP, likely cheaper in the stores. $599 is the MSRP to likely be cheaper in the store. Looks like a replacement for my shield..nite sights..better capacity outstanding..
Just found my next carry gun! All I need now is a date I can pick one up! Don’t hold your breath on the few weeks availability. These thing always show up 6-9 months after they announced available and then it’s on Gun Broker with some shop charging 300 over MSRP. This is based on 37 years experience in this business. I do want one though. Leave a Reply to Joshua Gillem Click here to cancel reply.